Winning twice during the Spruce Meadows ‘Masters’ is not easily accomplished, but top American rider Kent Farrington showed speed was the key in the $125,000 Suncor Winning Round 1.50m. He and Blue Angel, an 11-year-old AES mare by Luidam x Ascendent owned by Robin Parsky, returned second to last in the second round. The top eight from the first round came back with a clean slate, and it was Farrington’s ride of 44.26 seconds that secured victory. Setting the early pace and slotting into second place was crowd favorite Eric Lamaze (CAN) and Quelmec du Gery, who stopped the clock in 44.41 seconds. 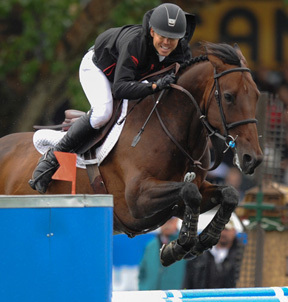 Ian Millar (CAN) and Star Power were third in 44.56 seconds. Lamaze had to move down in the original first round order when Quelmec du Gery pulled a shoe in the warm-up. With the shoe back on and with bell boots, he jumped around well with an incredible hind end clearance at each jump.